Diacan - Illusive Design Inc.
Diacan is an e-commerce website that facilitates an environment in which a visitor can have an engaging experience shopping for jewellery for every occasion. 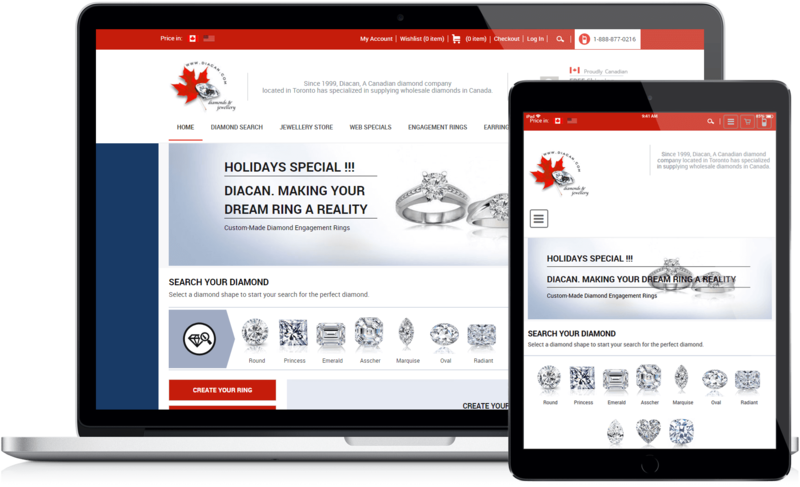 The mobile responsive design has been targeted at those who are not only looking for premium Canadian diamond jewellery but also those that are looking for customized pieces. These personalized pieces can be arranged through selecting a loose diamond, arranging the appropriate setting, and creating a fully customized ring or earring. 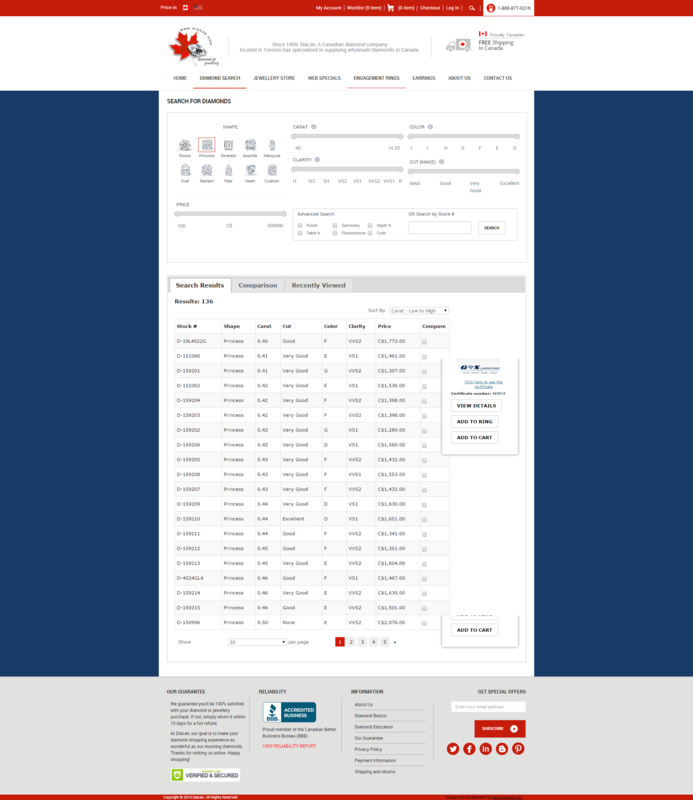 The mobile responsive design utilized to create the Diacan website allows for bulk inventory uploading from storeowners and/or from direct suppliers. This means suppliers from all over the world can upload their own inventory more options for the customers and a better user experience. Each product has it’s own gallery of high definition photographs and video contents and detailed description of each of its attributes. The customer can search from thousands of items and use advanced search options to zoom in to the list of items that she prefers. The online payment system utilized is equipped with the newest in internet security to ensure that a visitor’s personal information is being protected at all times. 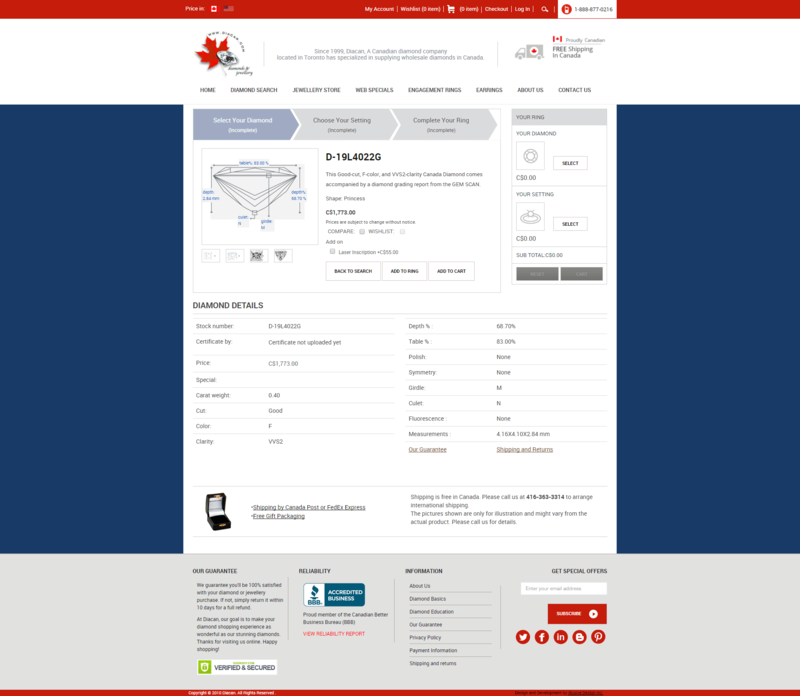 The site allows a customer to easily search through thousands of products held within the Diacan database. When a customer settles on a product, they can use a variety of different currencies, all automatically adjusted based on existing daily exchange rates. This brings visitors from not only Canada but overseas as well. Furthermore the Diacan site allows for Elavon payment gateway integration ensuring multiple methods in which a prospective customer can make a purchase. Diacan utilizes site-specific applications to allow users to create their own custom jewellery through a selection of a diamond(s), inputting their personal settings, and thereby creating their own custom ring or earring. Headquartered in Toronto since 1999, Canada Diamond has been specializing in supplying customized diamonds to Canadians directly via their website. With the company offering the latest trends in design, Diacan’s Create-a-Diamond feature is a unique addition to their site. Through the site build and incorporating search engine optimization within the fundamentals of its design, Diacan now has a Page 1 ranking on Google! 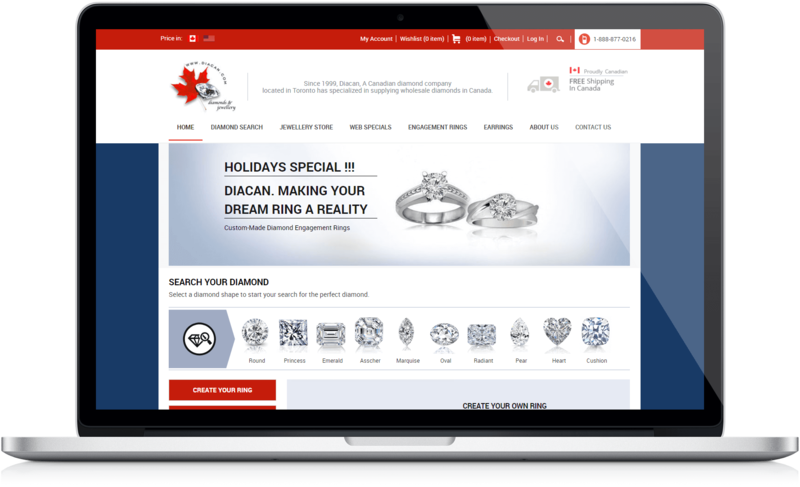 This means that any time a person searches for diamonds in Canada, the Diacan site is guaranteed to be viewed on the very first page of search results. This has brought the company more customers than their website has ever had in the past. Analyzing the on-site traffic has told us that customers now spend 3 times as much time on the website than they did before our re-design! 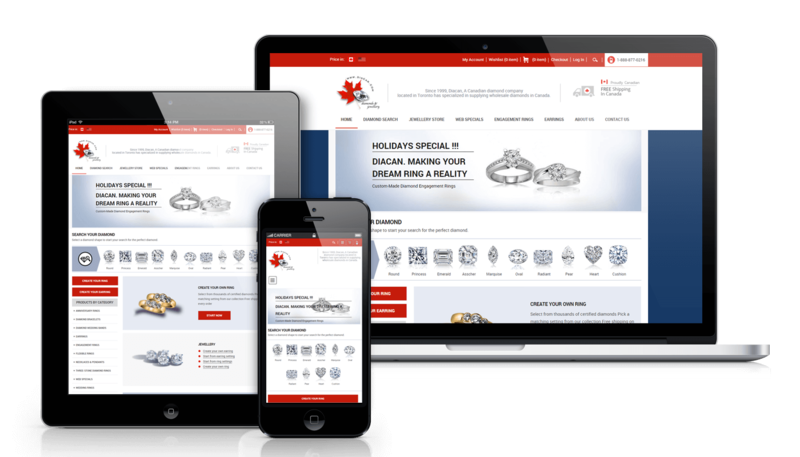 Among the numerous state-of-the-art features and functionalities this site has a mobile-friendly and easy-to-use custom jewellery builder that can help a customer build her own ring or earring by combining a diamond with a setting of her choosing.